As you've all probably realised by now, I'm absolutely obsessed with perfumes and the Marc Jacobs perfumes are some of my all time favourites; mostly because of the way they look but they also smell amazing. The Blush Collection was released in 2016 and marketed as being for the sophisticated. To be honest, as soon as I saw this collection I was desperate to be able to own all three fragrances as they look beautiful. Seeing the original versions compared to these limited editions, the shades of pink really does add a special pop to the range and I think it makes the bottle designs even more appealing. Although with all of these things in mind, it's also important to remember that these scents are definitely not cheap; in fact, they're definitely leaning closer to high end. I love perfumes, to the point that I collect them; I've even bought empty bottles from eBay. When I saw that Marc Jacobs had a new collection out, a feminine, pink based collection, I knew straightaway that I would be in love and need the whole collection in my life. Now that I have the three fragrances, I thought that I would write a blog detailing the differences between the three and which one is my favourite. A variation of the original Daisy, it comes in a pretty pink bottle with three daisies on the lid in varying shades of pink and three different sizes, matching the original with the gold centres that hide a gold spritzer. The scent matches the very feminine feels of the bottle, with notes of lily of the valley, honeysuckle, mimosa, waterlily, pear, bergamot, musk and wood. I do like the scent very much, but the price tag of £54 for 50ml feels a little excessive; however for a limited edition scent it's probably worth it. I like the smell and it holds well on the skin, but it's not my favourite of the three new editions. I love perfume so much that I knew I needed to collect all three perfumes when I saw them. This version is probably the best value for the money as its a 75ml bottle. A variation of the original Daisy Eau So Fresh, it's a more feminine styling, using a pink bottle with a bouquet of daisies on the lid in different sizes and shades of pink with gold centres; I actually really love the feminine twists that are the main pull of the Blush collection. The bottles visually appeal to me very much. Again, the price of this scent is fairly expensive, priced at £59 but you do get more fragrance for that small difference in price. The scent itself is very light and easy to wear, smelling of violet, waterlily, bergamot, freesia, rose, lily of the valley, musk and vetiver. I like the scent more than Daisy Blush but it doesn't last as long on the skin, which is a shame. 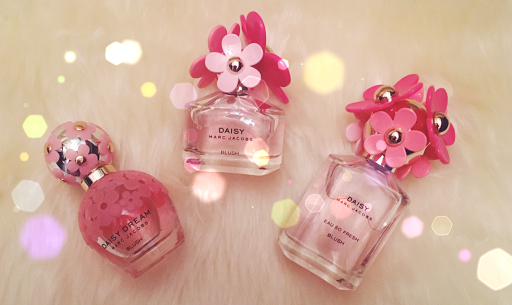 A new limited version of the original Daisy Dream, for me personally this is my favourite of the collection; I adore the way that the pink tones have made an already beautifully designed bottle much more feminine and the smell of the fragrance is also amazing. Smelling of violet leaves, pear, water lily, honeysuckle, rose blossom and freesia, it is an incredibly romantic scent. It lasts fairly well on the skin, roughly the same amount of time as Daisy Blush which is a few hours; not bad compared to Daisy Eau So Fresh Blush which definitely has the least longevity. It feels great against the skin and visually looks great with a pink bottle with pink cut out Daisy accents and a silver lid filled with pink daisies with gold centres. All of the fragrances are similar, but this fragrance is the one that feels the most expensive, which for the price £54, it should do.